Gujarat is simmering again. 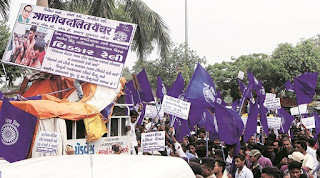 Dalits are agitating over criminals indulging in criminality. These criminals, who are fondly referred to as “cow vigilantes” by the mainstream media, have recently stripped and flogged four Dalit youth in Una. The resultant protests have claimed two lives: a policeman has reportedly been killed in stone pelting in Amreli and a youth consumed poison in protest. These deaths are the latest in the spate of violence caused by criminal cow vigilantism. Worse has been inflicted across India. Three men were similarly stripped and flogged in Pratapgarh, Rajasthan, last month. Two more were lynched, one a minor, in Latehar, Jharkhand, a couple of months back. These two were then hung by a tree. Even earlier, members of such a group had killed another in Nahan, Himachal Pradesh. One can count numerous such attacks since the incumbent regime came to power in May 2014. The attacks imply something sinister, something the Republic should be taking notice of, and addressing urgently. 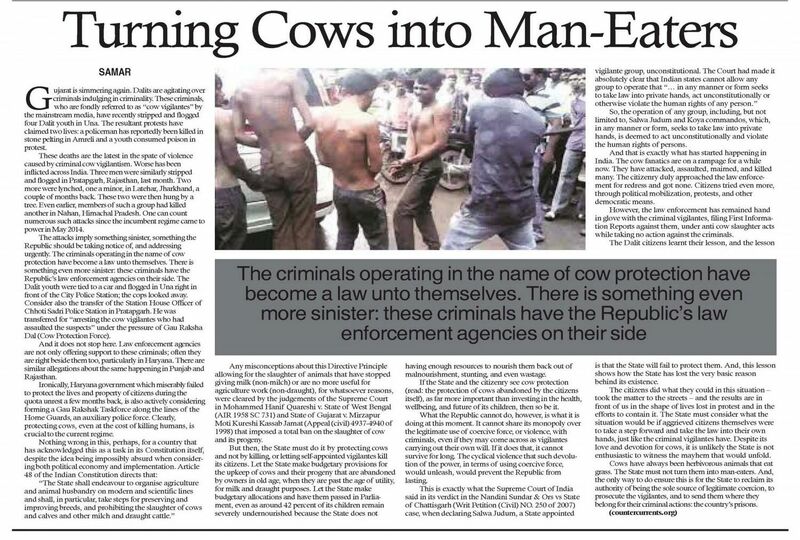 The criminals operating in the name of cow protection have become a law unto themselves. There is something even more sinister: these criminals have the Republic’s law enforcement agencies on their side. The Dalit youth were tied to a car and flogged in Una right in front of the City Police Station; the cops looked away. Consider also the transfer of the Station House Officer of Chhoti Sadri Police Station in Pratapgarh. He was transferred for “arresting the cow vigilantes who had assaulted the suspects” under the pressure of Gau Raksha Dal (Cow Protection Force). And it does not stop here. Law enforcement agencies are not only offering support to these criminals; often they are right beside them too, particularly in Haryana. There are similar allegations about the same happening in Punjab and Rajasthan. Ironically, Haryana government which miserably failed to protect the lives and property of citizens during the quota unrest a few months back, is also actively considering forming a Gau Rakshak Taskforce along the lines of the Home Guards, an auxiliary police force. 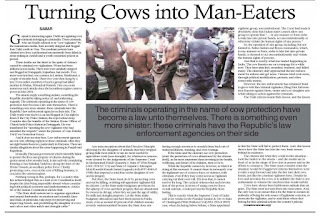 Clearly, protecting cows, even at the cost of killing humans, is crucial to the current regime. Any misconceptions about this Directive Principle allowing for the slaughter of animals that have stopped giving milk (non-milch) or are no more useful for agriculture work (non-draught), for whatsoever reasons, were cleared by the judgements of the Supreme Court in Mohammed Hanif Quareshi v. State of West Bengal (AIR 1958 SC 731) and State of Gujarat v. Mirzapur Moti Kureshi Kassab Jamat (Appeal (civil) 4937-4940 of 1998) that imposed a total ban on the slaughter of cow and its progeny. But then, the State must do it by protecting cows and not by killing, or letting self-appointed vigilantes kill its citizens. Let the State make budgetary provisions for the upkeep of cows and their progeny that are abandoned by owners in old age, when they are past the age of utility, for milk and draught purposes. Let the State make budgetary allocations and have them passed in Parliament, even as around 42 percent of its children remain severely undernourished because the State does not having enough resources to nourish them back out of malnourishment, stunting, and even wastage. If the State and the citizenry see cow protection (read: the protection of cows abandoned by the citizens itself), as far more important than investing in the health, wellbeing, and future of its children, then so be it. What the Republic cannot do, however, is what it is doing at this moment. It cannot share its monopoly over the legitimate use of coercive force, or violence, with criminals, even if they may come across as vigilantes carrying out their own will. If it does that, it cannot survive for long. The cyclical violence that such devolution of the power, in terms of using coercive force, would unleash, would prevent the Republic from lasting. So, the operation of any group, including, but not limited to, Salwa Judum and Koya commandos, which, in any manner or form, seeks to take law into private hands, is deemed to act unconstitutionally and violate the human rights of persons. And that is exactly what has started happening in India. The cow fanatics are on a rampage for a while now. They have attacked, assaulted, maimed, and killed many. The citizenry duly approached the law enforcement for redress and got none. Citizens tried even more, through political mobilization, protests, and other democratic means. However, the law enforcement has remained hand in glove with the criminal vigilantes, filing First Information Reports against them, under anti cow slaughter acts while taking no action against the criminals. The Dalit citizens learnt their lesson, and the lesson is that the State will fail to protect them. And, this lesson shows how the State has lost the very basic reason behind its existence. The citizens did what they could in this situation – took the matter to the streets – and the results are in front of us in the shape of lives lost in protest and in the efforts to contain it. The State must consider what the situation would be if aggrieved citizens themselves were to take a step forward and take the law into their own hands, just like the criminal vigilantes have. Despite its love and devotion for cows, it is unlikely the State is not enthusiastic to witness the mayhem that would unfold. Cows have always been herbivorous animals that eat grass. The State must not turn them into man-eaters. And, the only way to do ensure this is for the State to reclaim its authority of being the sole source of legitimate coercion, to prosecute the vigilantes, and to send them where they belong for their criminal actions: the country’s prisons.